Lots of things going on this week! 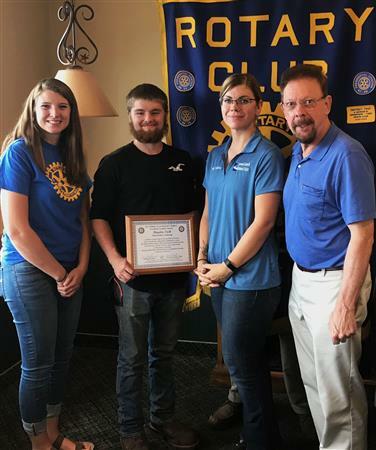 Cody Wilby of Norwood-Norfolk Central School, a student in the Multi Occupations program at BOCES Seaway Tech, is the Rotary Club of Potsdam BOCES Student of the Month for September. At a Rotary luncheon honoring Wilby he met with Potsdam Rotarians and was commended for his academic excellence by Seaway Tech School instructor Matt Tebo. Left to right: Potsdam Rotary President Mary Sue Foster, Wilby, Tebo and Rotary Vocational Service Chair Paul McGrath. The Rotary Club of Potsdam will honor Christa Carroll of Potsdam and Shawn Seymour of Hannawa Falls with the Paul Harris Award, and Robert R. Burns of Potsdam with the Service Above Self Award, at its annual dinner on Wednesday, June 21, at the Elks Lodge, 10 Elm St., in Potsdam, N.Y.
SUNY Canton Mortuary Science Club "Adopts-a-Senior"
The Mortuary Science Club at SUNY Canton donated eight baskets filled with wonderful, various items for Potsdam Rotary's "Adopt A Senior" program. 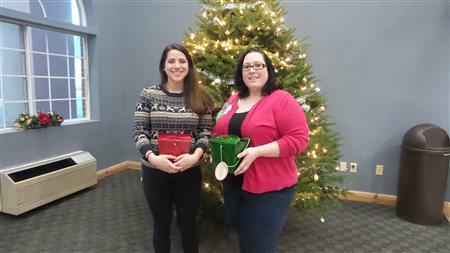 Pictured are Allison Phillips (l), of the Mortuary Science Club, and Erica Leonard, president of the Potsdam Rotary Club. Donations will be accepted for the Adopt a Senior program until December 15. You may take donations to Harris Medical, on Market Street in Potsdam. Jordahn Roth, a student in the Criminal Justice program at BOCES Seaway Tech, is the Rotary Club of Potsdam BOCES Student of the Month for September. At a Rotary luncheon honoring Roth, she met with Potsdam Rotarians and was commended for her academic excellence by Seaway Tech School instructor Juddy Plumb. Left to right: Potsdam Rotary President Erica Leonard, Roth, Vocational Service Chair Paul McGrath and Plumb. The Potsdam Rotary Club meets at noon at the Potsdam Elks Club each Wednesday. Guests are welcome! Nicholas Salacka of Norwood-Norfolk Central School, a student in the Automotive Technology program at BOCES Seaway Tech, was the Rotary Club of Potsdam BOCES Student of the Month for November. At a Rotary luncheon honoring Salacka, he met with Potsdam Rotarians and was commended for his hard work by Seaway Tech School instructor Mike Ellis. 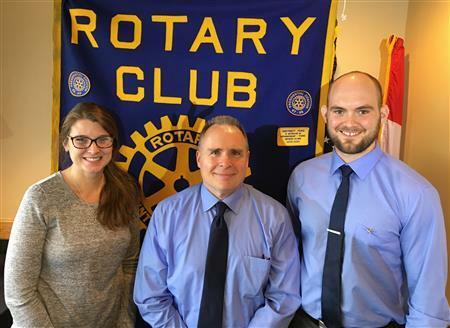 Left to right: Ellis, Salacka, Potsdam Rotary President Amanda Crump and Vocational Service Chair Paul McGrath. Mary Sue Foster of Hannawa Falls was recently recognized as a Paul Harris Fellow by the Rotary Club of Potsdam. Foster was honored for her demonstrated commitment to the goals and purposes of Rotary and "in appreciation of her tangible assistance given for the furtherance of better understanding and friendly relations among peoples of the world." One-thousand dollars has also been donated in Foster's name to the Rotary Foundation, a not-for-profit corporation that supports the efforts of Rotary International to achieve world understanding and peace through international humanitarian, educational, and cultural exchange programs. The contribution honoring Foster will be used for projects like saving the lives of children through immunization, bringing water to remote global villages, or the establishment of hospitals in under-developed countries. Foster is the owner of Harris Medical Supplies & Equipment and All About Me Post Mastectomy Boutique in Potsdam. She joined Rotary in 1997 and has served on the board of directors since 1998. Foster served two terms as president of the club and was the founder and longtime advisor of the Potsdam Central School Inter Act Club. Foster began chairing the Wheelchair Foundation project for Potsdam Rotary five years ago, and since then the club has provided more than 100 wheelchairs around the world. She has chaired or co-chaired many projects during her time as a Potsdam Rotarian, including benches in Ives Park, books for the Potsdam Holiday Fund, clothing vouchers for students, calculators and backpacks for students, bottled water projects, new member induction, and anniversary and changeover celebrations. The Rotary Club of Potsdam will honor Mary Sue Foster with the Paul Harris Award at its annual dinner on Wednesday, June 24, at Sergi's Banquet Hall in Potsdam. Amanda Crump will also be installed as 2015-2016 president at the event, while Christa Carroll will be honored as outgoing president. Foster will be honored as a Paul Harris Fellow for her demonstrated commitment to the goals and purposes of Rotary and "in appreciation of her tangible assistance given for the furtherance of better understanding and friendly relations among peoples of the world." This will be the second Paul Harris Award for Foster, who is a two-time past president and longtime board member of Potsdam Rotary. She is the president and owner of Harris Medical Supplies and Equipment in Potsdam. All Rotarians and past Rotarians, members of the community, and family, friends and colleagues of Mary Sue Foster are invited to attend. A social hour with a cash bar gets underway at 5:30 p.m. A buffet dinner will be served at 6:30. Tickets are available by advance purchase for $25 per person. Checks can be made out to “Potsdam Rotary” and sent to Potsdam Rotary, PO Box 912, Potsdam, NY 13676. All reservations must be received by Friday, June 19. Please call Christa Carroll at 315-267-2434 or Rotary_President_1415@twcny.rr.com with questions. The Potsdam Rotary Club meets each Wednesday at noon at Ponderosa in Potsdam. 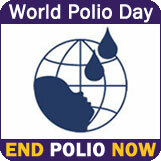 For more information, visit the club’s Web site at www.potsdamrotary.org. 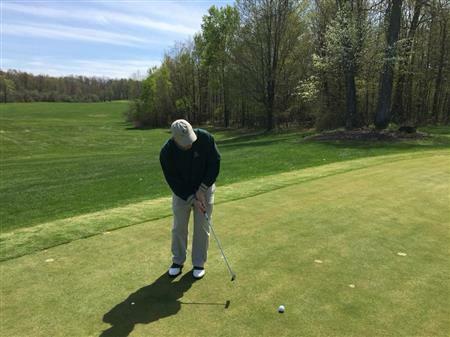 The Rotary Club of Potsdam invites the North Country community to its 11th Annual Potsdam Rotary Scholarship Golf Tournament on Friday, May 15, at the Potsdam Town & Country Club. Registration will begin at 10:30 a.m. with a shotgun start at 11:30. Registrations for foursomes are now being accepted. The cost includes greens fees, carts, and a clambake dinner. The event will take place regardless of weather. Registration is due by April 22. The money raised from the tournament is used for a BOCES College Scholarship Program, as well as for other community projects, such as a Potsdam High School Scholarship, the Potsdam Holiday Fund, Reading Book Program and the Rotary Youth Leadership Award. Please contact Amanda Crump at 315-274-3145 or potsdamrotariansecretary@gmail.com to register a team by April 22 or to participate as a sponsor to support this great event. The Rotary Club of Potsdam appreciates your support! Emily Chambers of Potsdam Central School, a student in the Health Careers program at BOCES Seaway Tech, is the Rotary Club of Potsdam BOCES Student of the Month for March. At a Rotary luncheon honoring Chambers, she met with Potsdam Rotarians and was commended for her hard work by Seaway Tech School instructor Anne Bonno. Left to right: Potsdam Rotary President Christa Carroll, Bonno, Chambers, and Vocational Service Chair Paul McGrath. Sean Owney of Potsdam Central School, a student in the Criminal Justice program at BOCES Seaway Tech, is the Rotary Club of Potsdam BOCES Student of the Month for February. At a Rotary luncheon honoring Owney, he met with Potsdam Rotarians and was commended for his hard work by Seaway Tech School instructor Judd Plumb. Left to right: Potsdam Rotary President Christa Carroll, Owney, Plumb, and Vocational Service Chair Paul McGrath. Leanne Cary of Colton-Pierrepont Central School, a student in the Culinary Arts program at BOCES Seaway Tech, is the Rotary Club of Potsdam BOCES Student of the Month for January. At a Rotary luncheon honoring Cary, she met with Potsdam Rotarians and was commended for her hard work by Seaway Tech School instructor Theresa Smith. Left to right: Potsdam Rotary President Christa Carroll, Smith, Cary, and Vocational Service Chair Paul McGrath. 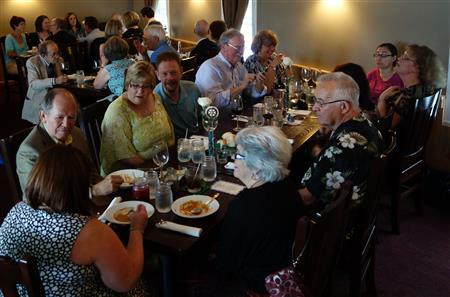 The Potsdam Rotary Club meets each Wednesday at noon at Ponderosa in Potsdam. Guests are welcome. 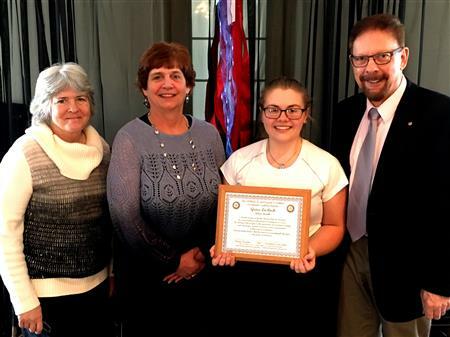 Krista Phippen of St. Lawrence Central School, a student in the Early Childhood Education program at BOCES Seaway Tech, is the Rotary Club of Potsdam BOCES Student of the Month for November. At a Rotary luncheon honoring Phippen, she met with Potsdam Rotarians and was commended for her hard work by Seaway Tech School instructor Sonya Taylor. Left to right: Potsdam Rotary President Christa Carroll, Phippen, Taylor, and Vocational Service Chair Paul McGrath. 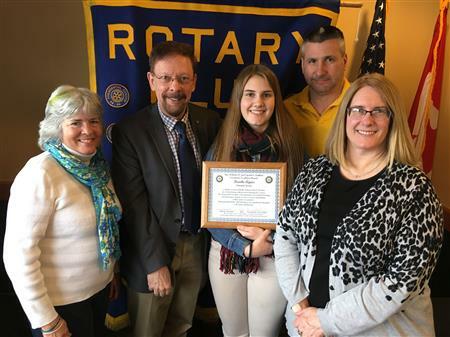 Laura Petry of Canton Central School, a student in the Allied Health program at BOCES Seaway Tech, is the Rotary Club of Potsdam BOCES Student of the Month for December. At a Rotary luncheon honoring Petry, she met with Potsdam Rotarians and was commended for her hard work by Seaway Tech School instructor Leanne Saxby. Left to right: Potsdam Rotary President Christa Carroll, Petry, Vocational Service Chair Paul McGrath, and Saxby. Nathan Hanson of Parishville-Hopkinton Central School, a student in the Multi-Occupations program at BOCES Seaway Tech, is the Rotary Club of Potsdam BOCES Student of the Month for October. At a Rotary luncheon honoring Hanson, he met with Potsdam Rotarians and was commended for his hard work by Seaway Tech School instructor Richard Rupert. Left to right: Potsdam Rotary President Christa Carroll, Hanson, Vocational Service Chair Paul McGrath, and Rupert. 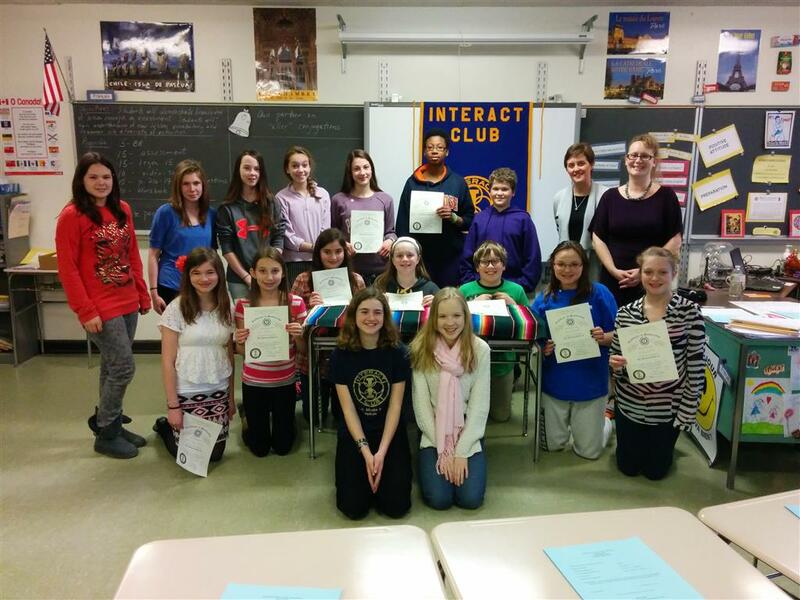 The Rotary Club of Potsdam sponsors the Interact Club of A.A.Kingston Middle School in Potsdam, N.Y. Pictured below are energetic members of Interact who participated recently in Potsdam. Rotary's Wheelchair Challenge, an actual race in wheelchairs to raise awareness and funds for disabled individuals in need of wheelchairs around the world. This year's Wheelchair Challenge makes possible the purchase of 17 wheelchairs, with matching support from the Wheelchair Foundation. Interact Clubs represent the next generation of leaders using their energy and enthusiasm to tackle issues they care about. Interact clubs connect students ages 12-18 to carry out service projects and have fun. On September 16, we held the 10th Annual Potsdam Rotary Golf Tournament at the Potsdam Town and Country Club. As the major fundraiser for our club, we raised over $4,700 to support our local and international projects. 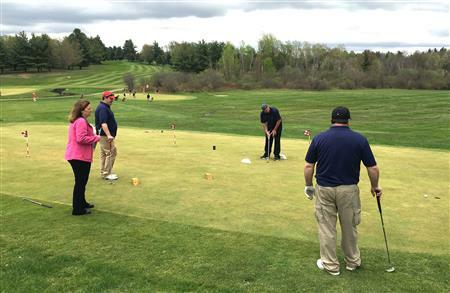 The golfers were treated to lunch, 18 holes of golf, and dinner, featuring a clambake, shrimp and barbecue and a putting contest at the turn. Everyone had a great time and we look forward to next year’s tournament on May 15, 2015! The Rotary Club of Potsdam recently contributed a donation of $100 to the Potsdam Volunteer Fire Department. Above, Potsdam Rotary President Christa Carroll (left) presents a check to Assistant Chief Danielle Rose, who also addressed the club during their meeting. Victoria Collins of Parishville-Hopkinton Central School, a student in the Cosmetology program at BOCES Seaway Tech, is the Rotary Club of Potsdam BOCES Student of the Month for September. At a Rotary luncheon honoring Collins, she met with Potsdam Rotarians and was commended for her hard work by Seaway Tech School instructor Nicole Rutledge. Left to right: Potsdam Rotary President Christa Carroll, Collins, Rutledge, and Vocational Service Chair Emeritus Bill Cuthbert. The Potsdam Rotary Club will hold its 10th Annual Scholarship Golf Tournament at the Potsdam Town & Country Club on Friday, September 12, with check-in starting at 10:30 a.m., a shotgun start at 11:30 and a clam bake dinner to follow. Registrations for foursomes are now being accepted and are limited to the first 35 teams. The cost is $340 per team, which includes greens fees, carts, and the clambake dinner. Please contact Rotarian Theresa Smith at 315-212-3099 to register. Rev. William R. Cuthbert of Potsdam was recognized with the Service Above Self Award by the Rotary Club of Potsdam during its annual changeover dinner in June. The club honored Cuthbert with the award in recognition of his outstanding contributions to the Potsdam community. Christa Carroll of Potsdam, N.Y., was installed as the 2014-2015 president of the Rotary Club of Potsdam at its annual dinner in June. During the ceremony, Amy Flack was recognized as outgoing president and Amanda Crump was recognized as incoming vice president. Maureen Farina of Potsdam was recognized on June 25 as a Paul Harris Fellow by the Rotary Club of Potsdam. Farina was honored for her demonstrated commitment to the goals and purposes of Rotary and "in appreciation of her tangible assistance given for the furtherance of better understanding and friendly relations among peoples of the world." Shawntel Courtney of Parishville-Hopkinton Central School, a student in the Pharmacy Tech program at BOCES Seaway Tech, is the Rotary Club of Potsdam BOCES Student of the Month for May. At a Rotary luncheon honoring Courtney, she met with Potsdam Rotarians and was commended for her hard work by Rotary Vocational Service Chair Paul McGrath. Left to right: McGrath, Courtney and Potsdam Rotary President-Elect Christa Carroll. The AAK InterAct Club recently held its new member Induction Ceremony. Eleven new members were inducted, including Brigid Barstow, Ann Beauchamp, Ellie DeRosa, Alison Ettinger-DeLong, Emma French, Hannah Holt, Keyana Johnson, Ana Jukic, Patrick Maciel, Alana McDonald, and McKenna Yette. These new inductees were joined by senior members Theo Cannamela, Violet Dean, Sarah Dominy, and Kristen Parker. Potsdam Rotary President Amy Flack and Potsdam Rotary President Elect Christa Carroll were present to add their support to the inductees. Justin Holmes of Canton Central School, a student in the Building Trades program at BOCES Seaway Tech, is the Rotary Club of Potsdam BOCES Student of the Month for April. At a Rotary luncheon honoring Holmes, he met with Potsdam Rotarians and was commended for his hard work by Seaway Tech School instructor Glen Perry. 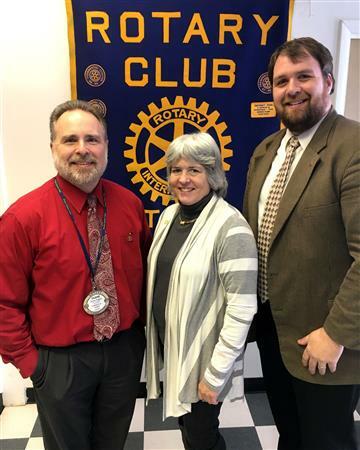 Left to right: Potsdam Rotary President-Elect Christa Carroll, Holmes, Vocational Service Chair Paul McGrath, and Perry. Leaman Anson of Canton Central School, a student in the Automotive Technology program at BOCES Seaway Tech, is the Rotary Club of Potsdam BOCES Student of the Month for March. At a Rotary luncheon honoring Anson, he met with Potsdam Rotarians and was commended for his hard work by Seaway Tech School instructor Austin Hicks. Left to right: Potsdam Rotary President Amy Flack, Anson, Hicks, and Vocational Service Chair Paul McGrath. Dustin Baxter of Norwood Norfolk Central School, a student in the Metalworking Technology program at BOCES Seaway Tech, is the Rotary Club of Potsdam BOCES Student of the Month for February. At a Rotary luncheon honoring Baxter, he met with Potsdam Rotarians and was commended for his hard work by Seaway Tech School instructor Nancy Collins. Left to right: Potsdam Rotary Vocational Service Chair Emeritus Bill Cuthbert, Baxter, Collins, and Vocational Service Chair Paul McGrath. Dylan Casselman of Massena Central School, a student in the Environmental Technology program at BOCES Seaway Tech, is the Rotary Club of Potsdam BOCES Student of the Month for January. At a Rotary luncheon honoring Casselman, he met with Potsdam Rotarians and was commended for his hard work by Seaway Tech School instructor Gene Mullaney. Left to right: Potsdam Rotary President Amy Flack, Mullaney, Casselman and Vocational Service Chair Paul McGrath. Paul Steenberg of St. Lawrence Central School, a student in the HVAC/R program at BOCES Seaway Tech, is the Rotary Club of Potsdam BOCES student of the month for December. At a Rotary luncheon honoring Steenberg, he met with Potsdam Rotarians and was commended for his hard work by Seaway Tech School instructor Jack Gardner. Left to right: Potsdam Rotary President Amy Flack, Gardner, Steenberg and Vocational Service Chair Paul McGrath. 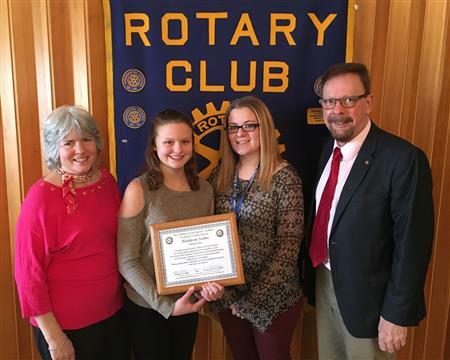 Kayla Bedore of Parishville-Hopkinton Central School and a student in the health careers program at BOCES Seaway Tech is the Rotary Club of Potsdam BOCES student of the month for November. At a Rotary luncheon honoring Bedore, she met with Potsdam Rotarians and was commended for her hard work by Seaway Tech School instructor Anne Bonno. Left to right: Potsdam Rotary President Amy Flack, Bedore, and Vocational Service Chair Paul McGrath. Just a reminder that we will be assembling more than 320 Holiday Fund food baskets on Tuesday, Dec. 17, at the Church of Jesus Christ of the Latter Day Saints at 21 Castle Drive - starting at about 3:45 p.m. Delivery is Wednesday, Dec. 18, at 8 a.m.
We could also use a couple more people with trucks to help pick up the food and turkeys at IGA on both days. If you have not already signed up to help, please let me know, by email or call Laura at 261-5412. We need everyone - so bring a friend! 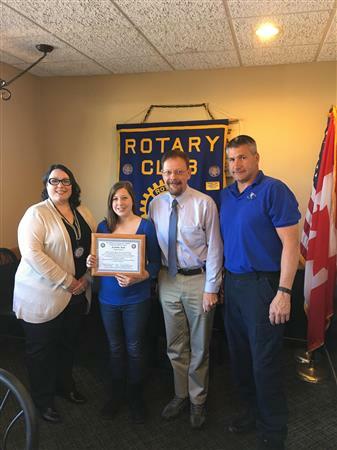 Marissa Denny of Norwood-Norfolk Central School and a student in the criminal justice program at BOCES Seaway Tech, is the Rotary Club of Potsdam BOCES student of the month for October. At a Rotary luncheon honoring Denny, she met with Potsdam Rotarians and was commended for her hard work by Seaway Tech School instructor Juddy Plumb. Left to right: Potsdam Rotary President Amy Flack, Denny, and Vocational Service Chair Paul McGrath. The Rotary Club of Potsdam will host its “Taste of the Town” wine, beer and food tasting event on Friday, November 8, from 6-8 p.m. at the Elks Lodge, 10 Elm St., in Potsdam. “Taste of the Town” is an event designed to showcase the products of local beer and wine producers, wine distributors, and local restaurants and food producers. Musical entertainment will be by local jazz pianist Samuel Whitesell. The fundraiser will benefit ShelterBox USA, which provides victims of disaster with shelter. Tickets are $25 per person and can be purchased from any Potsdam Rotarian or by sending your $25 donation to the “Rotary Club of Potsdam,” PO Box 912, Potsdam, NY 13676. For more information about the Taste of the Town, please call 315-268-4282. Rebecca Carabello, a home-schooled student from the Potsdam Central School and a student in the early childhood education program at BOCES Seaway Tech, is the Rotary Club of Potsdam BOCES student of the month for September. At a Rotary luncheon honoring Carabello, she met with Potsdam Rotarians and was commended for her hard work by Seaway Tech School Counselor Joan DeRosie. 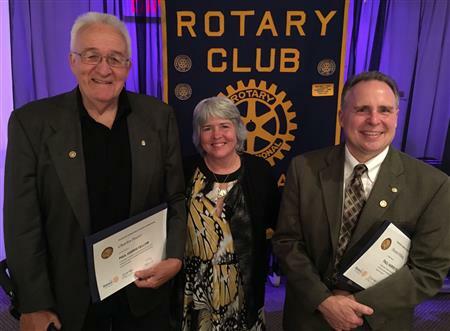 Left to right: DeRosie, Carabello, Potsdam Rotary Vocational Service Chair Paul McGrath and President Amy Flack. 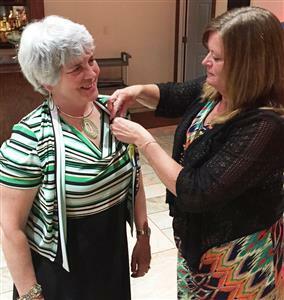 Amy Flack was installed as the 2013-2014 president of the Rotary Club of Potsdam at its 85th anniversary dinner in June. Rotary District 7040 Assistant District Governor Walt Mulyca performed the ceremony, during which Christa Carroll was recognized as incoming president-elect and Maureen Farina as outgoing president. The Rotary Club of Potsdam honored Chip, LuAnn and Rick Cross, who own the Potsdam IGA, with the Service Above Self Award at its 85th Anniversary Dinner in June. The Cross family was honored in recognition of their outstanding contributions to the Potsdam community. Pictured above, the Cross family and IGA staff are presented with the Service Above Self Award. Left to right: Katherine Cross- Hovey, Chip Cross, LuAnn Cross, Stacey Cross- Koloski, Rotary 2013-2014 President Amy Flack, Rick Cross, Sheila Perry. Theresa Dumont, Chris Dumont, Kim Rutley, and Jimmy Griffin. Anthony Oney of Canton Central School, a student in the multi-occupations program at BOCES Seaway Tech, is the Rotary Club of Potsdam BOCES student of the month for May. At a Rotary luncheon honoring Oney, he met with Potsdam Rotarians and was commended for his hard work by Seaway Tech Instructor Mike Bice. Left to right: Potsdam Rotary President Maureen Farina, Oney, Bice, and Rotary Vocational Service Chair Paul McGrath. Robert Barlow of Norfolk, N.Y., was inducted as the newest member of the Rotary Club of Potsdam at its June 5 meeting. He is the assistant branch manager of First Niagara Bank in Potsdam. The Rotary Club of Potsdam will honor Chip, (Potsdam Rotarian) LuAnn and Rick Cross, who own the Potsdam IGA, with the Service Above Self Award at its 85th Anniversary Dinner on Wednesday, June 26, in the Cheel Campus Center at Clarkson University in Potsdam, N.Y.
Tyler Sunday of Massena Central School, a student in the allied health program at BOCES Seaway Tech, is the Rotary Club of Potsdam BOCES student of the month for April. At a Rotary luncheon honoring Sunday, he met with Potsdam Rotarians and was commended for his hard work by Seaway Tech Instructor Leanne Saxby. Left to right: Potsdam Rotary President Maureen Farina, Sunday, Rotary Vocational Service Chair Paul McGrath, and Saxby. Jessica Burns of Potsdam Central School, a student in the cosmetology program at BOCES Seaway Tech, is the Rotary Club of Potsdam BOCES student of the month for February. At a Rotary luncheon honoring Burns, she met with Potsdam Rotarians and was commended for her hard work by Seaway Tech Instructor Dianne Brown. Left to right: Potsdam Rotary President Maureen Farina, Burns, Brown, and Rotary Vocational Service Chair Paul McGrath. Kali Crisler of St. Lawrence Central School, a student in the culinary arts program at BOCES Seaway Tech, is the Rotary Club of Potsdam BOCES student of the month for January. At a Rotary luncheon honoring Crisler, she met with Potsdam Rotarians and was commended for her hard work by Seaway Tech Instructor Theresa Smith. Left to right: Potsdam Rotary President Maureen Farina, Crisler, Smith, and Rotary Vocational Service Chair Paul McGrath. Brandon LaFave of Canton Central School, a student in the building trades program at BOCES Seaway Tech, is the Rotary Club of Potsdam BOCES student of the month for December. At a Rotary luncheon honoring LaFave, he met with Potsdam Rotarians and was commended for his hard work by Seaway Tech instructor Glen Perry. Left to right: Potsdam Rotary President Maureen Farina, LaFave, Perry, and Rotary Vocational Service Chair Paul McGrath. Randy Hartson of St. Lawrence Central School, a student in the automotive technology program at BOCES Seaway Tech, is the Rotary Club of Potsdam BOCES student of the month for November. At a Rotary luncheon honoring Hartson, he met with Potsdam Rotarians and was commended for his hard work by Seaway Tech instructor Mike Ells. Left to right: Potsdam Rotary President Maureen Farina, Ells, Hartson, and Rotary Vocational Service Chair Paul McGrath. The Rotary Club of Potsdam has announced the vendors participating, thus far, in its “Taste of the Town” wine, beer and food tasting event on Friday, November 30, from 6-8 p.m. at the Elks Lodge, 10 Elm St., in Potsdam. The Rotary Club of Potsdam has donated $1,000 to the Potsdam Holiday Fund. The club will also provide about $1,000 in new books for the fund to distribute as holiday gifts to children. The Rotary Club of Potsdam will host its “Taste of the Town” wine, beer and food tasting event on Friday, November 30, from 6-8 p.m. at the Elks Lodge, 10 Elm St., in Potsdam. “Taste of the Town” is an event designed to showcase the products of local beer and wine producers, wine distributors, and local restaurants and food producers. Theresa Smith of West Stockholm, N.Y., was inducted as the newest member of the Rotary Club of Potsdam at its September 5 meeting. She is the business manager of Slic Network Solutions and Nicholville Telephone. George Lavigne of was inducted as the newest member of the Rotary Club of Potsdam at its May 30 meeting. Lavigne is the general manager of the Clarkson Inn in Potsdam. The Rotary Club of Potsdam will honor Peggy Snell with the Paul Harris Award at its annual dinner on Wednesday, June 20, at the Cheel Campus Center at Clarkson University in Potsdam, N.Y.
Maureen Farina will also be installed as 2012-2013 president at the event, while Lowell Warner will be honored as outgoing president. 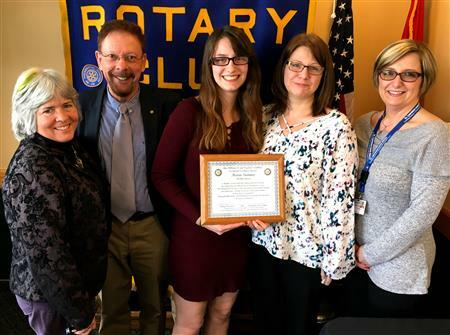 Mariah Kaiser of Canton Central School, a student in the health careers program at BOCES Seaway Tech, is the Rotary Club of Potsdam BOCES student of the month for April. At a Rotary luncheon honoring Bown, she met with Potsdam Rotarians and was commended for her hard work by Seaway Tech instructor Carol Lytle. Left to right: Potsdam Rotary President Lowell Warner, Kaiser, Lytle, and Rotary Vocational Service Chair Paul McGrath. Stephen Davis of Potsdam Central School, a student in the criminal justice program at BOCES Seaway Tech, is the Rotary Club of Potsdam BOCES student of the month for March. At a Rotary luncheon honoring Bown, he met with Potsdam Rotarians and was commended for his hard work by Seaway Tech instructor Ken Plumb. Left to right: Plumb, Potsdam Rotary President Lowell Warner, Davis, and Rotary Vocational Service Chair Paul McGrath. The Rotary Club of Potsdam will hold a “Taste of the Town” wine, craft beer and food tasting event on Wednesday, April 4, from 5:30-8 p.m. at the Elks Lodge, 10 Elm St., in Potsdam. Trenton Bown of St. Lawrence Central School, a student in the pre-engineering program at BOCES Seaway Tech, is the Rotary Club of Potsdam BOCES student of the month for February. At a Rotary luncheon honoring Bown, he met with Potsdam Rotarians and was commended for his hard work by Seaway Tech teacher Elizabeth Wultsch. Left to right: Potsdam Rotary President Lowell Warner, Wultsch, Bown and Rotary Vocational Service Chair Paul McGrath. Earlier this year, the Potsdam Rotary InterAct Club from AAK Middle School in Potsdam joined the Potsdam Rotary for lunch for a year-end celebration during the Rotary Club’s weekly meeting at the Ponderosa. 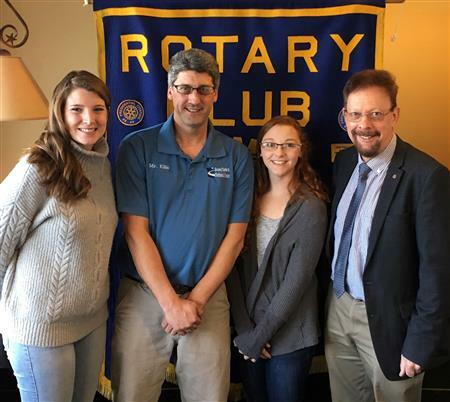 Taylor Rawson, InterAct Club President, presented the Potsdam Rotary a check for $100 towards Pennies for Polio, an international Rotary effort to eradicate polio worldwide, and provided an update on InterAct’s accomplished projects. At a Rotary luncheon honoring Ross, she met with Potsdam Rotarians and was commended for her hard work by Seaway Tech Instructor Leanne Saxby. Left to right: Potsdam Rotary President Lowell Warner, Saxby, Ross, and Vocational Service Chair Paul McGrath. At a Rotary luncheon honoring Shirley, he met with Potsdam Rotarians and was commended for his hard work by Seaway Tech Instructor Matt Rahn. Left to right: Potsdam Rotary President Lowell Warner, Rahn, Shirley, and Vocational Service Chair Paul McGrath. Sherman is the office manager at Plumley Real Estate, LLC. Her husband, Randy, recently purchased the firm. She is in the process of renewing her real estate license and expanding on that to obtain her broker’s license. Rotary International District 7040 Governor Bill Gray visited the Rotary Club of Potsdam on Wednesday. Gray addressed the club at its luncheon meeting and met afterward with its board of directors. Cortney Siddon of Louisville, N.Y., was inducted as the newest member of the Rotary Club of Potsdam at its Wednesday, July 13, meeting. Siddon is business development representative for Kelly Services in Potsdam. Facebook users, find your Potsdam Rotary Club and all our events also listed on facebook. Lowell Warner of Colton was installed as the 2011-2012 president of the Rotary Club of Potsdam at its annual dinner meeting on June 29. Shawn Seymour of Hannawa Falls was recognized on June 29 as a Paul Harris Fellow by the Rotary Club of Potsdam. The Rotary Club of Potsdam will honor Sam and Carmela Spagnolo with the Service Above Self Award, and Shawn Seymour with the Paul Harris Award at its annual dinner on Wednesday, June 29, at the Cheel Campus Center at Clarkson University in Potsdam, N.Y.
Thomas Ramsdell of St. Lawrence Central School, a student in the auto technology program at BOCES Seaway Tech, is the Rotary Club of Potsdam BOCES student of the month for April. At a Rotary luncheon honoring Ramsdell, he met with Potsdam Rotarians and was commended for his hard work by Seaway Tech Instructor Mike Ells. Left to right: Ramsdell; his mother and father, Liz and Craig Ramsdell; Ells; Potsdam Rotary President Neal Zirn; and Vocational Service Chair Paul McGrath. The Rotary Club of Potsdam has donated more than $800 worth of scientific calculators and backpacks to the Potsdam Neighborhood Center for children to use in the upcoming school year. The Rotary Club purchased the supplies with support from a Rotary District 7040 grant funded by the Rotary Foundation. Potsdam Rotary also donates food items to the Neighborhood Center to distribute to children during summer months when school meals are not available. Left to right: Rotary President Elect Lowell Warner, Project Chair Mary Sue Foster, Neighborhood Center Director Sandra Merchant and Rotary President Neal Zirn. 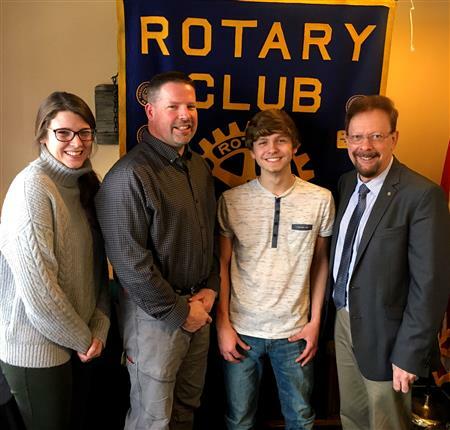 Ryan Rotonde of Massena Central School, a student in the metal welding technology program at BOCES Seaway Tech, is the Rotary Club of Potsdam BOCES student of the month for March. At a Rotary luncheon honoring Rotonde, he met with Potsdam Rotarians and was commended for his hard work by Seaway Tech Instructor William French. Left to right: Rotonde’s mother, Lisa Rotonde; Ryan Rotonde; French; and Potsdam Rotary President Neal Zirn. Beginning March 23, the Potsdam Rotary Club will hold its meetings at the Potsdam Ponderosa, 185 Market Street. Be sure to attend and experience our new meeting location! Amanda Crump of Colton was inducted as the newest member of the Rotary Club of Potsdam at its Wednesday, February 23, meeting. Crump is the vice president branch manager at HSBC Bank in Potsdam. She has worked at the bank for nearly a decade and has been in banking for almost 12 years. Crump earned her bachelor’s degree in accounting from Everest University and is now pursuing her MBA at Devry University. She is a 1999 graduate of Parishville-Hopkinton Central School. “I am excited about the opportunity to work with the Rotary Club and to get HSBC back out into the community,” says Crump. Kerry Foster of St. Lawrence Central School, a student in the environmental technology program at BOCES Seaway Tech, is the Rotary Club of Potsdam BOCES student of the month for February. At a Rotary luncheon honoring Foster, he met with Potsdam Rotarians and was commended for his hard work by Seaway Tech Instructor Gene Mullaney. Left to right: Potsdam Rotary President Neal Zirn, Vocational Service Chair Paul McGrath, Mullaney, Foster, and his parents, Kerry and Kathy Foster. Adam Kuenzler of Norwood Norfolk Central School, a student in the HVAC program at BOCES Seaway Tech, is the Rotary Club of Potsdam BOCES student of the month for January. At a Rotary luncheon honoring Kuenzler, he met with Potsdam Rotarians and was commended for his hard work by Seaway Tech Instructor Jack Gardner. Left to right: Gardner, Potsdam Rotary Vocational Service Chair Paul McGrath, Kuenzler, and his mother, Julie. The Rotary Club of Potsdam will hold a member-guest winter mixer this Wednesday, January 19, for Potsdam area business people interested in finding out more about Rotary. The event will take place from 5-7 p.m. at Dexter's Cafe in Thatcher Hall at SUNY Potsdam. The mixer will feature a fine assortment of hors d'oeuvres and drinks will be available. Rotary is the world's first service club organization, made up of more than 1.2 million men and women in more than 33,000 clubs worldwide. The Potsdam Rotary Club was established in 1928. Today it continues a long tradition of performing hands-on service projects and fund-raising for local, regional, and international causes. If you would like to attend and find out more about Rotary, please contact Lowell Warner at 244-5276 or lowellwarner@yahoo.com. The Potsdam Rotary Club meets each Wednesday at noon at Julian's. Guests are always welcome. Keisha Mossow of Massena Central School, a student in the health careers program at BOCES Seaway Tech, is the Rotary Club of Potsdam BOCES student of the month for December. At a Rotary luncheon honoring Mossow, she met with Potsdam Rotarians and was commended for her hard work by Seaway Tech Instructor Carol Lytle. Left to right: Potsdam Rotary President Neal Zirn; Vocational Service Chair Paul McGrath; Mossow; Mossow’s parents, Virginia and Derek Mossow; and Lytle. 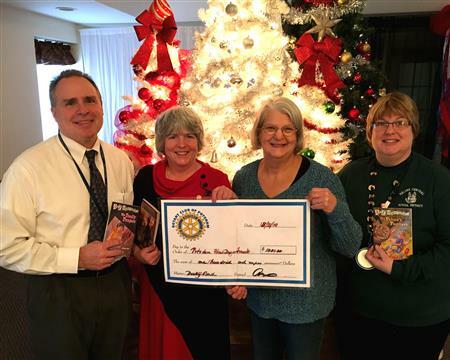 The Rotary Club of Potsdam has donated $2,200 in cash and new children’s books to the Potsdam Holiday Fund. Potsdam Holiday Fund President Pam Yurgartis (left) recently accepted a $1,000 check from Potsdam Rotary President Neal Zirn. In addition to the cash donation, the Rotary Club has purchased $1,247 worth of books to be given as gifts to children. Andrew Fiske of St. Lawrence Central School, a student in the criminal justice program at BOCES Seaway Tech, is the Rotary Club of Potsdam BOCES student of the month for November. At a Rotary luncheon honoring Fiske, he met with Potsdam Rotarians and was commended for his hard work by Seaway Tech Instructor Juddy Plumb. Left to right: Plumb; Fiske; Fiske’s father, Kevin; Rotary Vocational Service Chair Paul McGrath; and Rotary President Neal Zirn. 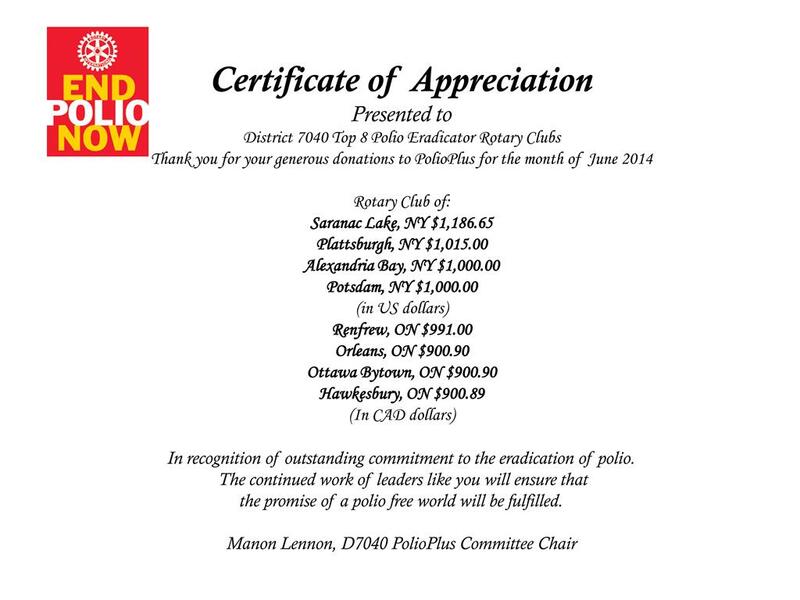 This summer, the Rotary Club of Potsdam was named a Top 8 Polio Eradicator Rotary Club by District 7040. D7040 PolioPlus Committee Chair Manon Lennon (left) presented a Certificate of Appreciation to Potsdam Rotary President Christa Carroll. We hope you can join the Potsdam Rotary Club at 9:30 a.m. on Saturday, October 19, as we support the Wheelchair Foundation with the purchase of wheelchairs for people who otherwise have no way to be mobile with dignity. The Challenge will take place at SUNY Potsdam's Maxcy Hall Fieldhouse (just off Outer Market Street, next to the tennis courts). 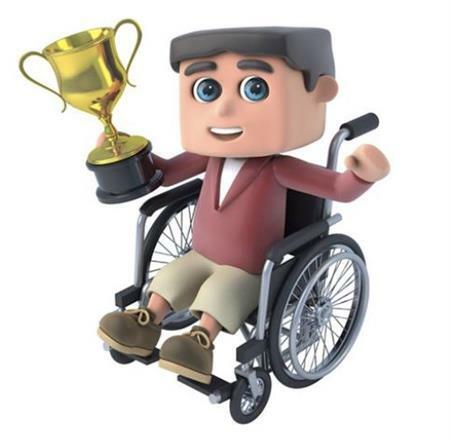 The Wheelchair Foundation matches every 4-person team's minimum $75 entry fee! No later than October 17, please email Mary Sue Foster at harrismedical@nnymail.com if you wish to register / sponsor a team. Vikie Jones, Michael Klein and Alison Roy were recently inducted into the Rotary Club of Potsdam. Jones is the branch manager of Adirondack Regional Federal Credit Union in Potsdam; Klein is the president of Wear on Earth in Potsdam; and Roy is co-owner of BodyWorks Chiropractic in Potsdam. The Rotary Club of Potsdam will hold its fourth annual benefit Food & Wine Tasting on Friday, October 29, from 6-8 p.m. at Clarkson University's Cheel Campus Center. Neal Zirn was installed as the 2010-2011 president of the Rotary Club of Potsdam at its annual dinner meeting on June 30. Debora Moschell of Potsdam and Michael P. Griffin of Colton were recognized on June 30 as Paul Harris Fellows by the Rotary Club of Potsdam. Moschell is finance manager at Penski Inc. in Potsdam. Griffin is director of news & digital content services at Clarkson University. The Rotary Club of Potsdam presented Dr. G. Michael Maresca and Barbara N. Maresca with the Service Above Self Award its annual dinner on June 30. Chris Plourde of Massena, a student in the multi-occupations program at BOCES Seaway Tech, is the Rotary Club of Potsdam BOCES student of the month for June. At a Rotary luncheon honoring Plourde, he met with Potsdam Rotarians and was commended for his hard work by Seaway Tech instructor David Chudzinski. Left to right: Seaway Tech teaching assistant Mike Rodenhouse, Plourde, Potsdam Rotary Vocational Service Chair Paul McGrath, and Chudzinski. 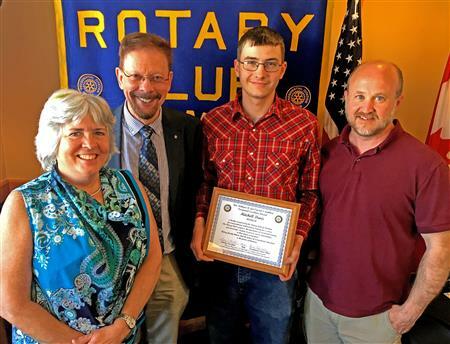 Jared Pollock of Norwood-Norfolk Central School, a student in the pre-engineering program at BOCES Seaway Tech, is the Rotary Club of Potsdam BOCES student of the month for May. At a Rotary luncheon honoring Pollock, he met with Potsdam Rotarians and was commended for his hard work by Seaway Tech instructor Tedd Kellogg. 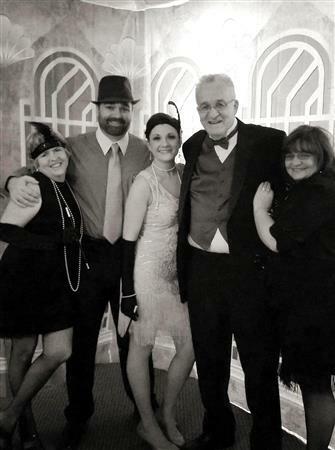 Left to right: Pollock's mother, Shari Taccino; Pollock; Kellogg; Potsdam Rotary Vocational Service Chair Paul McGrath; and President Deb Moschell. Paul Colbert of Parishville-Hopkinton School, a student in the allied health program at BOCES Seaway Tech, is the Rotary Club of Potsdam BOCES student of the month for April. At a Rotary luncheon honoring Colbert, he met with Potsdam Rotarians and was commended for his hard work by Seaway Tech instructor Leanne Saxby. Left to right: Colbert; his parents, Karen and Paul Colbert; Saxby; Potsdam Rotary President Deb Moschell; and Vocational Service Chair Paul McGrath. Dustin Wright of Massena, a student in the computer & business technology program at BOCES Seaway Tech, is the Rotary Club of Potsdam BOCES student of the month for March. At a Rotary luncheon honoring Wright, he met with Potsdam Rotarians and was commended for her hard work by Seaway Tech instructor Matt Rahn. Left to right: Potsdam Rotary President Deb Moschell, Vocational Service Chair Paul McGrath, Wright, Seaway Tech Counselor Mary Ann Ashley and Rahn. Clarkson Campus Dining was honored by the Rotary Club of Potsdam at its March 17 meeting for the extraordinary support it has provided to the club's annual Benefit Food and Wine Tasting. Campus Dining has sponsored the benefit for three consecutive years, allowing the Rotary Club to direct almost all of the events' proceeds to ShelterBox USA, which provides victims of disaster with shelter. Above, Potsdam Rotary President Deb Moschell (right) presents a plaque to Clarkson Campus Dining Catering Manager Kim Keeley. Kara Beaulieu of Colton-Pierrepont Central School, a student in the cosmetology program at BOCES Seaway Tech, is the Rotary Club of Potsdam BOCES student of the month for February. At a Rotary luncheon honoring Beaulieu, she met with Potsdam Rotarians and was commended for her hard work by Seaway Tech instructor Sandy Young. 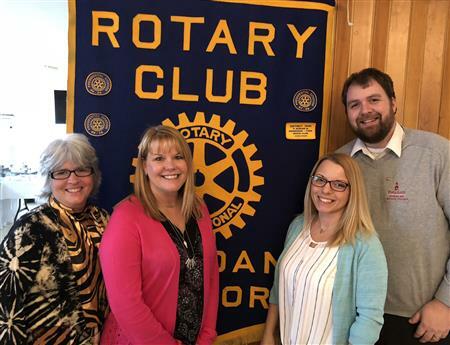 Left to right: Rotary Vocational Service Chair Paul McGrath, Kara's mother Carrie Beaulieu, Beaulieu, Young, and Potsdam Rotary President Deb Moschell. Here's a good Time magazine story on ShelterBox. We bought two ShelterBoxes in the fall with the proceeds from the Food- & Wine-tasting Benefit. Chris Mitchell Jr., a student in the culinary arts program at BOCES Seaway Tech, is the Rotary Club of Potsdam BOCES student of the month for January. At a Rotary luncheon honoring Mitchell, he met with Potsdam Rotarians and was commended for his hard work by Seaway Tech instructor Theresa Smith. Left to right: Seaway Tech Counselor Joan DeRosie, Smith, Mitchell, stepfather Shawn Sullivan, mother Flossie Wawrzyniak, Rotary Vocational Service Chair Paul McGrath, and Potsdam Rotary President Deb Moschell. Jacob Fisher, a senior at Madrid-Waddington Central School and a student in the metalworking (formerly welding) program at BOCES Seaway Tech, is the Rotary Club of Potsdam BOCES student of the month for October. At a Rotary luncheon honoring Fisher, he met with Potsdam Rotarians and was commended for his hard work by Seaway Tech instructor William French. Left to right: Rotarian Becky Delles, Fisher, French, and Potsdam Rotary President Deb Moschell. Daniel Eng, a senior at Norwood-Norfolk Central School and a student in the building trades program at BOCES Seaway Tech, is the Rotary Club of Potsdam BOCES student of the month for December. At a Rotary luncheon honoring Eng, he met with Potsdam Rotarians and was commended for his hard work by Seaway Tech instructor Glen Perry. Left to right: Theresa Eng, Daniel's mother; Perry; Eng; Rotarian Mary Sue Foster; and Potsdam Rotary President Deb Moschell. The Rotary Club of Potsdam will hold its third annual benefit Food & Wine Tasting on Friday, October 30, from 6-8 p.m. at Clarkson University's Cheel Campus Center. In the past, we've done 2-hour shifts. If you want to help out, please e-mail Michael Griffin at mgriffin@clarkson.edu with your preferred date and time. Sterling Back of Massena, a student in the auto technology program at BOCES Seaway Tech, is the Rotary Club of Potsdam BOCES student of the month for November. At a Rotary luncheon honoring Back, he met with Potsdam Rotarians and was commended for his hard work by Seaway Tech instructor Michael Ells. Left to right: Potsdam Rotary Vocational Service Chair Paul McGrath, Back, Ells, and Potsdam Rotary President Deb Moschell. The Rotary Club of Potsdam will hold its inaugural "Wheelchair Challenge" to benefit The Wheelchair Foundation on Saturday, October 3, from 9 a.m. to noon at the SUNY Potsdam Field House at Maxcy Hall. Christopher M. Castle, vice president and branch manager at HSBC Bank USA, NA in Potsdam, was inducted as the newest member of the Rotary Club of Potsdam at its August 12 meeting. Lowell Warner, branch manager at KeyBank in Potsdam, was inducted as the newest member of the Rotary Club of Potsdam at its June 10 meeting. Debora Moschell of Potsdam was installed as the 2009-2010 president of the Rotary Club of Potsdam at the club's annual dinner meeting in June. Rotary District 7040 2009-2010 District Governor Arnold Lawrence performed the ceremony, during which Duane Pelkey was also recognized as the outgoing president. Paul B. McGrath and Donna J. Mosier of Potsdam were recognized in late June as Paul Harris Fellows by the Rotary Club of Potsdam. Jordan Arquitt of St. Lawrence Central School, a student in the environmental technology program at BOCES Seaway Tech, is the Rotary Club of Potsdam BOCES student of the month for June. At a Rotary luncheon honoring Pacific, he met with Potsdam Rotarians and was commended for his hard work by Seaway Tech instructor Jim Boula. Left to right: Rotary Vocational Service Chair Paul McGrath, Boula, Arquitt, and Potsdam Rotary President Duane Pelkey. 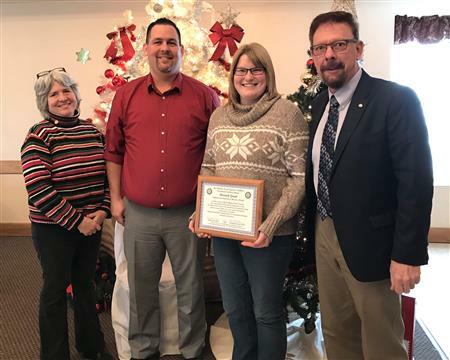 Lori Loffler, cash management sales officer at Community Bank, N.A., in Potsdam, was recently inducted into the Rotary Club of Potsdam. The Rotary Club of Potsdam will honor Paul B. McGrath and Donna J. Mosier with the Paul Harris Award and install 2009-2010 President Debora Moschell at its Paul Harris Award & Presidential Changeover Dinner on Wednesday, June 17, at the Cheel Campus Center at Clarkson University. Becky Delles, sales representative for Wireless World in Potsdam ("Your Hometown Verizon Wireless Premium Retailer") was inducted as the newest member of the Rotary Club of Potsdam at its March 18 meeting. 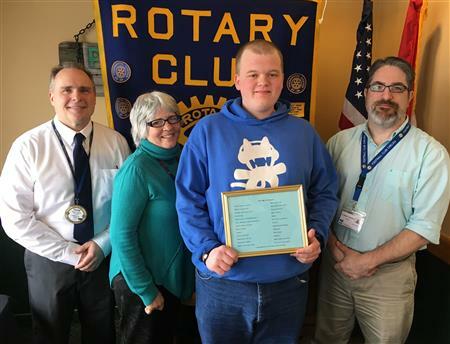 Jonathon Frego of Norwood-Norfolk School, a student in the criminal justice program at BOCES Seaway Tech, is the Rotary Club of Potsdam BOCES student of the month for March. At a Rotary luncheon honoring Frego, he met with Potsdam Rotarians and was commended for his hard work by Seaway Tech instructor Ken Plumb. Left to right: Potsdam Rotary Vocational Service Chair Paul McGrath, President Duane Pelkey, Frego and Plumb. 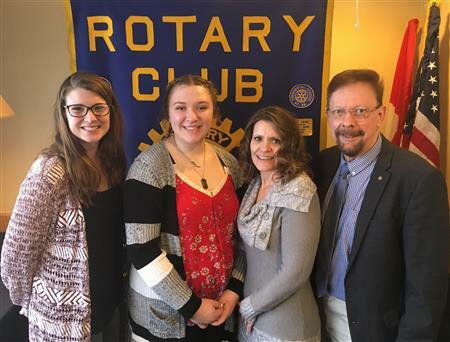 Hannah Remington of Parishville-Hopkinton School, a student in the early childhood education program at BOCES Seaway Tech, is the Rotary Club of Potsdam BOCES student of the month for February. At a Rotary luncheon honoring Remington, she met with Potsdam Rotarians and was commended for her hard work by Seaway Tech instructor Sonya Kinnear. Left to right: Rotary President Duane Pelkey, Remington and Vocational Service Chair Paul McGrath. Maureen Farina, assistant director of development and community relations for Hospice and Palliative Care of St. Lawrence Valley, was inducted as the newest member of the Rotary Club of Potsdam at its February 25 meeting. Proceeds from the Rotary Club of Potsdam's Benefit Food & Wine Tasting in November allowed the club to purchase three shelter boxes for ShelterBox USA, which provides victims of disaster with shelter. Presenting a $3,000 check to Rotary District 7040 Asst. District Governor Peter Basham (right) are (left to right) Potsdam Rotary President Duane Pelkey and wine tasting committee members Shawn Seymour and Michael Griffin. In addition to the 145 donors who purchased tickets to the event, the Rotary Club thanks the event's sponsor, Clarkson Campus Dining. Special thanks also go to Empire Distributors and door prize sponsors 1844 House, First Crush, T&R Wines & Liquors, Spirits of Hannawa Falls, and Village Wines & Liquors. Otto Czerepak of Potsdam, co-owner of The Tile Company, was inducted as the newest member of the Rotary Club of Potsdam at its January 14 meeting. Chris Morales of Massena Central School and a student in the multi occupations program at BOCES Seaway Tech is the Rotary Club of Potsdam BOCES student of the month for January. Darren Mesibov of Potsdam was inducted as the newest member of the Rotary Club of Potsdam at its December 10 meeting. Potsdam Rotarians and other Potsdam Holiday Fund volunteers made strides to "go green" with their food basket deliveries this year, thanks to several local businesses who donated 300 reusable tote bags for the effort. Bags sturdy enough to hold 20-pound turkeys were donated by the Potsdam Big M, P&C, Wal-Mart, Stewart's, Kinney Drugs, and Walgreens. Left to right: Rotarians Laura Cordts, Deb Moschell, and LuAnn Cross, along with Big-M co-owner Chip Cross, get started stuffing 285 turkey tote-bags! Christa Carroll of Potsdam was inducted as the newest member of the Rotary Club of Potsdam at its Wednesday, November 12, meeting. On Wednesday, October 29, the Potsdam Rotary Club will sponsor a presentation on "Energy for Sustainable Development" by Andrew Yager, Ph.D., Senior Economic Affairs Officer with the United Nations' Division for Sustainable Development. The presentation begins at 6 p.m. in the Clarkson Hall Amphitheater on Clarkson University's downtown campus in Potsdam. Admission is free and open to the public. The ticket deadline is approaching for our benefit Food & Wine Tasting on Friday, November 14, from 6-8 p.m. at Clarkson University's Cheel Campus Center. Tickets must be purchased by Thursday, November 6. Clarkson Campus Dining, the sponsor of the fundraiser, has completed the food menu for the event. Olga E. Grant of Massena was inducted as the newest member of the Rotary Club of Potsdam at its Wednesday, October 1, meeting. Olga Grant was installed as our newest Rotary Member. It was nice to see Sue and Greg Campbell visiting from Maine. Guest speaker was Varick Chittenden who gave an informative discussion on what TAUNY is all about. The center is open in Canton, NY on Main Street. Everyone should have received their packet of tickets to sell for the 2nd Annual Food & Wine tasting by now. If you need any more tickets please contact Mike Griffin. The guest speaker was Sandra Merchant from the Potsdam Neighborhood Center. She gave an emotional talk on how many families benefited from our food drive last summer. She had Rotarians open the thank you notes and read some of them â?" it's a wonderful program helping our many people and their families. Reminder by Duane/Mike to mark your calendar the for the 2nd annual benefit Food & Wine Tasting on Friday, November 14th, from 6-8 pm, at Clarkson University's Cheel Campus Center. The September 17 meeting featured a Club Assembly, during which issues like a new fundraiser for wheelchairs were discusssed. The Rotary Club of Potsdam will hold its second annual benefit Food & Wine Tasting on Friday, November 14, from 6-8 p.m. at Clarkson University's Cheel Campus Center. Mark your calendar for the Potsdam Holiday Fund Food Basket Project! We will assemble baskets on Tuesday afternoon December 16 (starting at about 3:45 pm) and deliver baskets on Wednesday morning December 17. This is a VERY LARGE service project, and we need all Rotarians, plus any friends and family members, to help out. Food baskets are assembled at Trinity Church. Laura Cordts is looking for a co-coordinator to help her with this project. Canton Rotary Club has invited us to join them at their noon meeting on Monday, Sept. 22 at the Best Western. They are hosting the Group Study Exchange Team from France . Team members will be the program that day. Please let Laura Cordts know if you plan to attend so she can get RSVP's to Canton. Duane Pelkey of Madrid was officially installed as the 2008-2009 president of the Rotary Club of Potsdam at the club's annual dinner meeting on June 25. Rotary District 7040 2008-2009 Governor Peter Basham performed the ceremony, during which Laura Cordts was also recognized as the outgoing president. Derry Loucks and Jim Mason of Potsdam were recognized June 25 as Paul Harris Fellows by the Rotary Club of Potsdam. Loucks is assistant manager of WPDM-WSNN Radio in Potsdam and Mason is Potsdam Town Justice and a BOCES criminal justice teacher. Life is sweet for Mitch Wilcox, who was named BOCES student of the month for May. Wilcox likes to cook and has a penchant for pastries, cakes, and sugar. That makes him invaluable in the Seaway Tech culinary arts program, according to instructor Theresa Smith. Smith called Wilcox one of the best students ever, and that shows in many ways. At Parishville-Hopkinton, Mitch is president of the student council, vice president of his class, and an active member of the stage crew and National Technical Honor Society. He has also done volunteer work for Special Olympics. Wilcox plans to attend the New England Culinary Institute and then pursue additional higher education. He hopes to open his own bakery and restaurant. Mitch enjoys the support of his family who joined him at the recent Rotary lunch and who sample his experiments: Amber Wilcox, Kevin Wilcox, and Sue Yenoli. Seaway Area Tech Center student Cullen Laughing from Massena Central School is the Potsdam Rotary Club Student of the Month for April. Cullen is the son of Nola Mitchell, Cornwall Island. A student in the Building Trades class, Cullen is involved in building a home in partnership with the Norwood Kiwanis Club. He will be able to enter the field of construction with much experience upon completion of the program. Glen Perry, Cullen's instructor, has said the following about Cullen. "Cullen is very dedicated to his education and puts 100% into everything he does." Cullen has been on the honor roll both at Massena Central and Seaway Tech. He has been in the Chess Club for two years and employed at Food Basics in Cornwall for four years. The Rotary Club of Potsdam will honor Derry Loucks and Jim Mason with the Paul Harris Award and install 2008-2009 President Duane Pelkey at its Paul Harris Award & Presidential Changeover Dinner on Wednesday, June 25, at the Cheel Campus Center at Clarkson University in Potsdam, N.Y. Social Hour is at 5:30 p.m. with dinner at 6:30. All Rotarians, and family, friends and colleagues of the honorees are invited to attend. Casual dress is suggested. See photos from the Golf Tournament. Potsdam Rotarians celebrated the 1928 founding of the local club on April 23. A special reunion of former members highlighted the day. Among those Rotary alumni attending were Don Dangremond, Al Rothermal, Bill Fiesinger, Red Curtis and Seth Chgichester. Rotarians recalled the many community projects and personal relationships that emerged from their service. High on the list were founding the vocational excellence award with BOCES, building the Lawrence Avenue playground, building beach in Hannawa Falls, and working to establish the Potsdam Empire Zone. Reunion Rotarians also recalled the many Rotary conventions and conferences, the kazoo bands, and the golf tournaments. Club President Laura Cordts asked visitors to recall their fondest memories. Rotarians celebrated with a "birthday cake" donated by LuAnn Cross and the Big M. Several Rotarians thanked the club for honoring them as Paul Harris fellows. Luke Johnson of St. Lawrence Central School and a student in the Automotive Technology program is the BOCES student of the month. Seaway Tech instructor Mike Ellis commended Johnson for his willingness to tackle difficult problems, for his initiative, and for his dedication to quality. Johnson plays lacrosse and also races his Ford Mustang. The mustang is painted to resemble the Humvee his father drove in Iraq. Luke also likes to hunt and rade ATVs, but he certainly spends a lot of time working on cars. His goals are to first work for an automotive business and then open his own garage. Luke met with Potsdam Rotarians and was accompanied by his parents, Jonathan and Susan. LuAnn Cross was inducted into the Rotary Club of Potsdam on February 27. Cross is the owner of the Potsdam Big M with her husband Chip. Before purchasing the former IGA, Super Duper, she and her husband owned the Union Springs Big M for 17 years. Originally from Three Mile Bay, she is happy to once again call the North Country home. "I look forward to working with the members of Rotary International and serving on the many club and communinty projects," said Cross. Pat Brady was inducted as the newest member of the Rotary Club of Potsdam on March 19. Brady is the superintendent of schools in Potsdam. He holds a B.A. in history and master' degree in secondary social studies education from SUNY Potsdam. He also earned a master's in education administration from St. Lawrence University. Brady taught high school social studies at Potsdam Central School for 12 years and was a summer school teacher for Massena Central School before becoming its principal in 2000. He served as assistant principal at Massena High School from 2000-2002 and principal at J. William Leary Junior High in Massena from 2002-2005. Brady served eight years as the town supervisor of Potsdam and 11 years total on the Potsdam Town Council. Brady is a past Lions Club member in both Massena and Potsdam. He is also a member of the Norwood Lake Association. He resides in Potsdam with his wife Kelley and five children. Craig Donnelly of Brasher Falls is the BOCES student of the month for March. Donnelly is a student in the metalworking technology program at Seaway Tech. His instructor, Bill French, praised Donnelly's work ethic, intelligence, and diligence. He was accompanied at the recent Rotary meeting my his parents, Barbara and Craig. Donnelly plans to study architecture at the college level, beginning at SUNY-Canton. In part, this is an outgrowth of his work in his father's business, North Country Mill Work. Donnelly is also an award-winning musician who plays strings (guitar, banjo) among other instruments. He also likes dirt track racing, where he tests his street stock Thunderbird. Greg and Sue Campbell were visited in Florida by Michael and Nancy Griffin. Greg and Sue say hello to everyone and will be home soon. Tyson Back of Massena Central School has received the February student of the month award. Tyson is a student in the auto collision repair program, led by instructor Mike Bice. Tyson's mother, Melerena, joined him for lunch with Potsdam Rotarians. Mr. Bice described Tyson as hardworking, independent, and reliable. Following graduation, Tyson plans to study electrical engineering at SUNY Canton. In his free time, he plays hockey, lacrosse, and football, and he coaches minor hockey for girls. He enjoys the outdoors, including fishing and hunting, along with sled and stock car racing. Potsdam Rotary welcomed its third new member of the year on February 6 with the induction of Fred Hanss, who was sponsored by Duane Pelkey. Fred has twenty years of experience in community and economic development, most recently in the planning and development office of the Village of Potsdam. He was previously a member of the Canton Rotary Club. In his program presentation to the Club, Fred noted the importance of three factors in local economic development: land use regulations, infrastructure development, and incentives for new and existing businesses. Please welcome Fred Hanss to Rotary and to Potsdam. Potsdam Rotarians welcomed two new members on January 30. Vicky Strader works at Community Bank NA and has been involved in a number of community projects with the Boy Scouts and various scholarship programs. Vicky was sponsored by Duane Pelkey. Neal Zirn is a chiropractor, has interests in art and poetry, and has been on the board of the Chamber of Commerce. Neal was sponsored by Paul McGrath. Please introduce yourself to these new Rotarians and welcome them to the Potsdam club. Potsdam Rotarians aided the Holiday Fund along with many community members to distribute over 260 holiday baskets to local families. As in previous years, Rotary members packed holiday bags for families and distributed these along with food vouchers and turkeys. The Holiday Fund also provides food to the local Neighborhood Center. Along with food baskets, Rotarians provided hundreds of children's books as part of the annual holiday project. Mike Smith of Norwood-Norfolk Central School is the BOCES student of the month. Mike lunched with Potsdam Rotary on January 8 and was joined by his mother Maxine Smith and instructor Eugene Mulaney. Smith is a student in Seaway Tech's Environmental Technology program. This program engages students in the study of forestry, horticulture, and work with heavy equipment. Mike expects to earn a commercial driver's license and will be eligible to do field and environmental work using a variety of equipment. Instructor Mulaney praised Mike for his even temperment, work ethic, and dedication. In addition to his school work, Mike plays on the NNCS baseball team and enjoys an array of outdoor activities from hunting to woodsmanship and four-wheeling. Congratulations to Mike Smith, this month's BOCES outstanding student. 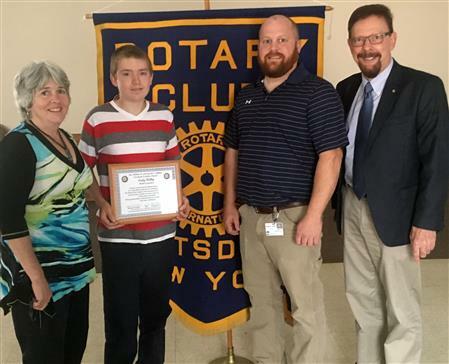 Thomas Sexton, son of Dave and Anne Sexton, North Lawrence, NY, is the Potsdam Rotary Club Student of the Month for November. As a student in the Heating, Ventilation and Air Conditioning Program, Tom can enter the work force or continue with his education at the collegiate level upon completion of the program. He earned his General Equivalency Diploma in April 2007. Jack Gardner, HVAC Instructor, has said the following about Tom. "He is very involved, wants to learn, does a good job, works steady and is dependable." Tom is also a member of the National Technical Honor Society, made the honor roll for past five quarters. He also was a member of the NYS FIRST Tech Challenge Robotics Team, which won first place out of 16 teams. Last year Tom was also Vice President of his church youth group. Norwood-Norfolk's Jennifer Pruner is the BOCES outstanding student for November. Jennifer is a student in the health careers program at Seaway Tech. She is interested in nursing and plans to pursue her RN education at SUNY-Canton. Instructor Ryan Young praised Jennifer for her hard work and positive attitude, characterizing her as a charge nurse in the making. Jennifer's interest outside of school range from her crochet work - blankets to dog sweaters - to shopping and movies. Her career goals put her on track to work on a maternity ward. In addition to Mr. Young, Jennifer was accompanied at the recent club meeting by Elizabeth Reynolds, her future mother-in-law. DG Edmond Lanthier and his wife Suzie visited Potsdam on October 31. He brought this year's message from the RI president which focused on the topic "Rotary Shares." Lanthier reminded Rotarians of their need to share their knowledge and giving and to have fun doing it. Rotary shares with people around the world to provide hope and assistance. Rotary membership is critical for clubs to do local projects and to give back to communities. And, when Rotarians contribute to the Rotary Foundation ("Every Rotarian Every Year"), the Foundation gives back by sharing in the cost of local projects. During his visit, Lanthier met with the club board to learn more about projects, fundraising, and membership goals. He pledged his assistance and the assistance of the District to continuing the growth of Rotary. Jenny Maybee was a Rotary Exchange student from Newton New Jersey, a small town of about 7000. Since she was in 4th grade she worked towards being selected for the exchange program. She felt trapped in this small town atmosphere, everyone knowing her as "Dale's daughter" and assumed she would excel anything that she did. Stephanie Randall from Norwood-Norfolk High School is the October student of the month. Stephanie is an outstanding student in the new criminal justice program at Seaway Tech. Instructor Jim Mason explained that this program is only two years old and growing. Likewise the criminal investigation program at SUNY-Canton has grown to a four-year program, and this is where Ms. Randall intends to further her education. Ms. Randall is a good student and an avid reader. She is a member of the National Technical Honor Society. Like many students, she juggles responsibilities ranging from her part-time job to helping to care for two nephews aged 2 and 3. Congratulations to Stephanie Randall, the first student of the month for 2007-08. Potsdam Rotarians will hold a wine tasting on November 9 from 6 to 8 pm at Clarkson's Cheel Campus Center. The event is sponsored by ARAMARK, whose chefs will provide an array of food and wine in association with local distributors. The fall fundraising event is to support the international Shelter Box program. Nancy and John Faddegon will kick off the Shelter Box fundraising program with a presentation to Potsdam Rotary on October 3. The cost of the wine tasting event is $25 per person. Shelter Box is an international program designed to provide disaster relief. A Shelter Box is a family support system that includes a ten-person tent, sleeping pads, water purification and storage equipment, and cooking and eating utensils. Rotary clubs around the world are raising funds to fund at least one Shelter Box per club per year. The Shelter Box project was conceived and developed by Tom Henderson, a member of the Rotary Club of Helston-Lizard, Cornwall District, in Great Britain as their Millennium Service Project. Struck with the urgent world-wide need for a self-contained emergency shelter unit when disaster occurs, Tom designed a tent, researched suppliers and, through trial and error, developed the Shelter Box.. The international relief agency Feed the Children, has called Tom's Shelter Box 'the best disaster relief tool they have seen in their 20 years of experience'. Canton-Potsdam Hospital's service excellence initiative is paying dividends. According to Jackie Scanlon (RCP and Director of Respiratory Care Services), who spoke to Rotarians on August 29, patient satisfaction exceeds 90% for most hospital services. CPH embarked on an agressive service improvement plan, intending to become the best place for patients, staff, and doctors. Satisfaction has improved remarkably against national standards through the hospital's commitment to excellence, service, and accountability. CPH regularly assesses satisfaction and has made a commitment to excellence at all levels. Over the past few years satisfaction has grown from a low of 11% to today's outstanding ratings. Rotarians from Potsdam, Canton, Massena, and Ogdensburg were guests at Dodge Pond on August 8. After a tour of the lodge and campsites, the visitors were treated to a talent show featuring most of the week's 35 campers. Dodge Pond, located in southern St. Lawrence County, offers week-long experiences for disabled children and adults. Operated by NYSARC, the camp welcomes visitors year-round. Regional Rotary clubs support Dodge Pond through fundraising and building projects. Since 2004, Rotarians in Jefferson and St. Lawrence counties have built camp lean-tos and helped maintain the camp. Brenda Thornton, new executive director of the Potsdam Chamber of Commerce, met with Rotarians on the heels of the Potsdam Summer Fest. This year's events drew over 60 vendors to Ives Park, over 25 musical acts on the main stage, and established the momentum for a year of activities. The Chamber is looking for committee members to begin work on next year's Summer Fest. The Chamber has a new web site with links to local retail, dining, lodging, and service businesses and organizations (including Rotary) and over 350 active Chamber members. Next up for Potsdam Chamber will be Fright Night activities on October 25 and 26. Ed Mucenski was recognized June 27 as a Paul Harris Fellow by the Rotary Club of Potsdam. Mucenski is a partner in the accounting firm Pinto, Mucenski and Watson PC in Potsdam. Laura J. Cordts was officially installed as the 2007-2008 president of the Rotary Club of Potsdam at the club's annual dinner meeting June 27. Rotary District 7040 2007-2008 Governor Edmond Lanthier, who traveled to Potsdam from Gatineau, Quebec, performed the ceremony, during which Carmen Paone was also recognized as the outgoing president. Kristie Jo Dowdle from Canton Central School is the BOCES student of the month. Kristie Jo recently completed the two-year early childhood education program and will continue her studies at SUNY-Canton in the fall. At the award presentation, Kristie Jo was accompanied by her parents, Cathy and Bruce Dowdle. Renee Langtry-Green, the program director, characterized Kristie Jo as "vibrant" and complimented her on being willing to try new things. Langtry-Green told Rotarians that 15 of 18 students in the BOCES early childhood program will be attending various colleges in the fall. Ms. Dowdle has been busy outside the classroom. She is the captain of the Canton soccer and softball teams. For the past two years, she has also worked at the American Theatre, running the front of the house. 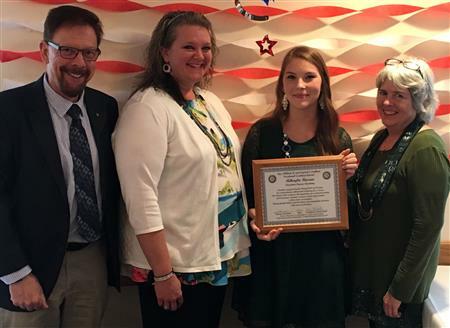 Kristie Jo is a member of the National Technical Honor Society. When school's out for the summer, many local children go without the breakfast and lunch they eat at school the rest of the year. You can help make sure no child in our community goes hungry this summer. Potsdam Rotrarians are collecting food at their business locations. Please encourage friends and co-workers to donate non-perishable nutritious breakfast and lunch items that kids would like! Please take collected items to the Potsdam Neighborhood Center next Friday, June 8, between 8am and 4pm. If your food collection is going very well, feel free to bring items to the Neighborhood Center sooner than June 8. Just make sure you tell someone there that what you're bringing is part of the Rotary project. Mike Griffin and Laura Cordts have extra collection bins if you would like to help with this new project. The Rotary Club of Potsdam will honor Ed Mucenski with the Paul Harris Award and install 2007-2008 President Laura Cordts at its Paul Harris Award & Presidential Changeover Dinner on Wednesday, June 27, at the Shoreline Restaurant in Hannawa Falls, N.Y. Social Hour is at 5:30 p.m. with dinner at 6:30. All Rotarians and community members are invited to attend. Casual dress is suggested. Potsdam Rotarians recognized Randy Bump, a student in the Multi Occupations program at Seaway Tech, as the BOCES student of the month on May 9. Randy is from Parishville-Hopkinton High School. He was accompanied by Teaching Assistant Mike Rodenhouse. Randy enjoys deer hunting, fishing, and camping, and works at the Silver Cafe in Parishville. Randy will work full-time on maintenance at school this summer through the VESID youth development program. Left to right: Rotarian Paul McGrath, Randy Bump, Rotary President Laura Cordts and BOCES Teaching Assistant Mike Rodenhouse. Potsdam Rotarians recognized Kandy Pecone, a student in the Allied Health program at Seaway Tech, as the BOCES student of the month. Kandy is from St. Lawrence Central School. In the fall, Kandy will attend a new cooperative program in respiratory therapy, starting at SUNY Canton and then moving to the Upstate Medical University. Allied health instructor Leanne Saxby noted that Kandy has won awards at the annual Health Occupation Students of American state competition and has been involved in job shadowing at Massena Memorial Hospital. Kandy also enjoys artist pursuits like painting, drawing, and ceramics. 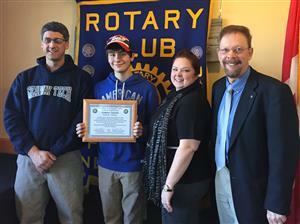 On March 14, Potsdam Rotarians honored two Seaway Tech students as "student of the month." Nicole Francis is from Canton and is a student in the cosmetology program. She was selected in January, and her award was postponed when the club cancelled its February 14 meeting due to snow. The February award went to Nathan Norquest from Potsdam, who is in the information technology program. Congratulations to both of these outstanding students! The Rotary Club of Potsdam recently presented the Potsdam Police Department with a contribution of $1,500 to cover training, vet bills, food and other expenses for Drake, the department's K-9. In 2005 the Club presented the department with $5,000 to cover Drake's initial training and expenses. The money was raised through donations from the community for the "Dress Down for Drake" event. Left to right: Rotary President Carmen Paone; K-9 Officer Scott Thompson; and Rotarians Kay Frederick and Laura Cordts, cochairs of the Drake fundraiser. St. Lawrence Central School's Wes Lincoln in the BOCES student of the month. Wes is a student in the Building Trades program at Seaway Tech and plans to attend SUNY-Canton's Construction Management program in the fall. Seaway Tech instructor Rob Boak said Wes is the kind of student whose work is always correct and high quality. Each year Seaway Tech students build a complete house from the foundation up. Wes is an avid hunter and fisherman when he is not working at his part-time job or working on one of his four cars and trucks. At the monthly award presentation, Rob Boak also complimented Wes's parents Nels and Debbie for their support. At it's December meeting The board approved the Nominating Committee's recommendation for Duane Pelkey as President Nominee (2008-2009 President) and Dave Moulton as a board member to fill out Amy Flack's term until June 2008. The club membership voted all in favor of these appointments at the Dec. 13 noon meeting. James Trimm (center), a student at St. Lawrence-Lewis BOCES Seaway Tech and Colton-Pierrepont High School, was named the BOCES Outstanding Student for the month of December. Here Vocational Service Committee Chair Paul McGrath and President Carmen Paone present Trimm with a certificate and cash award. Mitchell is studying automotive technology and enjoys hunting, four-wheeling, snowmobiling and working on cars and trucks in his spare time. Codie Mitchell (center), a student at St. Lawrence-Lewis BOCES Seaway Tech and Colton-Pierrepont High School, was named the BOCES Outstanding Student for the month of November. Here Vocational Service Committee Chair Paul McGrath and President-Elect Laura Cordts present Mitchell with a certificate and cash award. Mitchell is studying welding and mechanical work and enjoys hunting, fishing, snowmobiling and four-wheeling in his spare time. Preston Forbes of Potsdam is the BOCES outstanding student for the month of October. Forbes is a student in the automotive collision repair program at Seaway Tech working under the supervision of instructor Mike Bice. As might be expected, Forbes likes cars and races a semi-pro dirt track car with the supervision of his parents Ronald and Rosemary. Preston intends to further his education at a regional technical institution. In his spare time he enjoys hunting, four-wheeling, and snowmobiling. With high water and a strong current on the <?xml:namespace prefix = st1 ns = "urn:schemas-microsoft-com:office:smarttags" />Raquette River, 792 yellow rubber ducks accompanied by their Rotary Club and community duck wranglers in canoes and kayaks provided an exciting race on Saturday, July 8, near Ives Park during the Potsdam Summer Festival. The Rotary Club of Potsdam congratulates the 12 winners of the 2006 Rubber Duck Race. Group Study Exchange (GSE) is a program funded by The Rotary Foundation with the objective of promoting world understanding and peace. In addition, this program allows the GSE team of five individuals (1 Rotarian and 4 non-Rotarians) to experience the cultural, social, historical, geographical and vocational aspects of life in another Rotary District. In late spring 2007, an exchange will take place between Districts 7040 and 4840 (Paraguay and Argentina). The specific areas to be visited will be determined at a later date.Â At this time, the GSE committee is accepting applications for the position of team members. 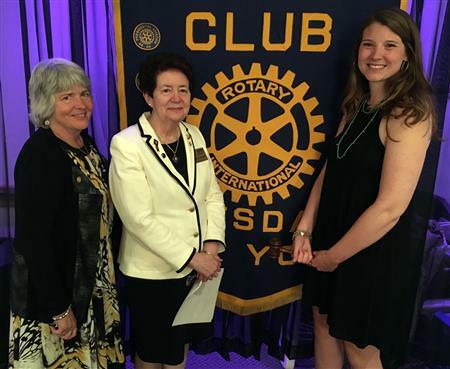 Rotarians Laura J. Cordts and Ruth F. Garner have been recognized as Paul Harris Fellows. Cordts is the executive director of the Canton-Potsdam Hospital Foundation and Garner is the deputy mayor of the <?xml:namespace prefix = st1 ns = "urn:schemas-microsoft-com:office:smarttags" />Village of Potsdam.